And at first the quote made me feel scared. Does this mean that I need to take the aspiring out from before the adult in my blog’s subtitle? Does this mean I should have everything together or feel more put together or figured out? 28 is the end of the the newish “emerging adult” categorization that conveniently popped into public consciousness around the time I graduated from college. But it’s also king of exciting. Because if the hardest years are (almost) behind me, that can only be a good thing, right? Maybe this is the year those things will start to fall into place – as much as they ever do because I know very, very, very few people of any age who have all that much figured out – and I suspect the ones that say they do might just be pretending. And birthdays are a lovely way for people to come together. My new roommates surprised me with cake and tequila shots and lovely symbolic presents for what they hope the year brings for me last night at midnight. Friends are texting and tweeting and writing me facebook messages. I’m about to go get some pumpkin flavored breakfast pastries and then am heading to The Morgan Library to see exhibits on Alice and Wonderland and Ernest Hemingway. Good, bad, or (most likely) in-between, I think 28 is going to be an interesting year. This entry was posted in Uncategorized by Alison Doherty. Bookmark the permalink. 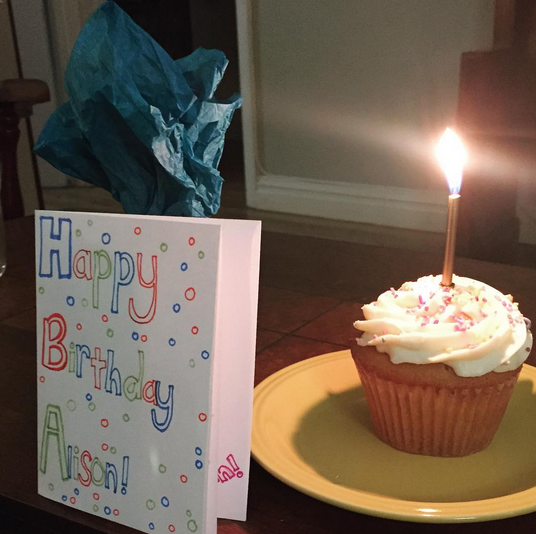 Happy Birthday Alison — I too an am aspiring adult…and plan to be forever. Thank you, Alison, for your birthday gift to all of us! Happy Birthday and pumpkin pastries! You are way too sweet. Thank you! Happy birthday, dear Alison!!!! I’m so glad everyone is making you feel so special– you are!!! Happy Birthday! Here’s to an epic year ahead 🙂 Have an awesome day. Thanks, Crystal! Had a great day and definitely am hoping for a little epic in the year ahead. Oh to be 28 again! And what fun you are having! (I want a pumpkin muffin!). About the “aspiring” adult: Well, you know I’m not 28 and haven’t been for a while; there’s a part of me that is still an aspiring adult. It keeps me from thinking I’ve experienced it all, and allows me to have the childlike wonder when something wonderfully unexpected comes along! You’re doing great!! Thanks, Patrice. I love the idea of keeping childlike wonder. Probably very important for me since I want to write for children and teenagers! Happiest of happy birthdays darling! I’m so glad you were born today! Biff! Thanks so much friend.